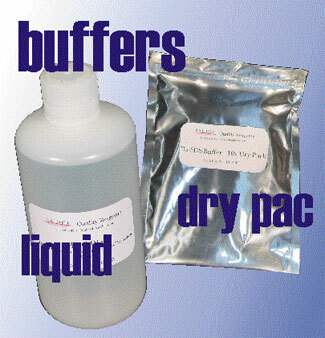 High Desert Bioscience electrophoresis buffers are available in both liquid and dry powder formulations. Look to High Desert for reliable, convenient and economical buffers for all your electrophoresis needs. Bridge dry packaged powder buffers required minimal storage space and offer virtually unlimited shelf life. Dry packaged buffers are offered at the indicated concentrations and should be disolved into sufficient pure water to produce the final concentration you require. Choose High Desert agarose for repeatable results.